Although the song is talking about christmas, for me, it is spring. Although anytime I get to visit my garden now becomes the most wonderful time of year. 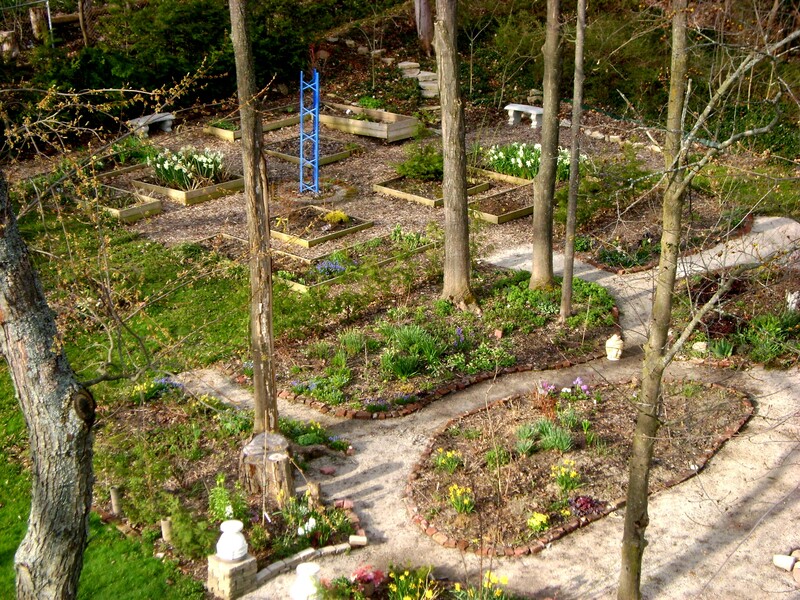 But here was spring in my garden (a bit late), I was soooo very excited. Just a quick look at what was happening all around me. This one I took the moment I arrived, just starting to get dark. Another problem with trying to post two months later, I can’t remember if this is Jelena or Magic Fire, I am inclined to think the latter. Crocus Roseus, although looking a bit more lilac here. And perhaps, if I lie to myself, a few more tommies then last year. love the ice blue flowers. often referred to as a spring Colchicum. There was lots more in bloom, but I have to leave you wanting more, lol…. This has to be one of my most popular posts. I am not sure why, did everyone like the idea of me risking life and limb,to climb up on my roof? 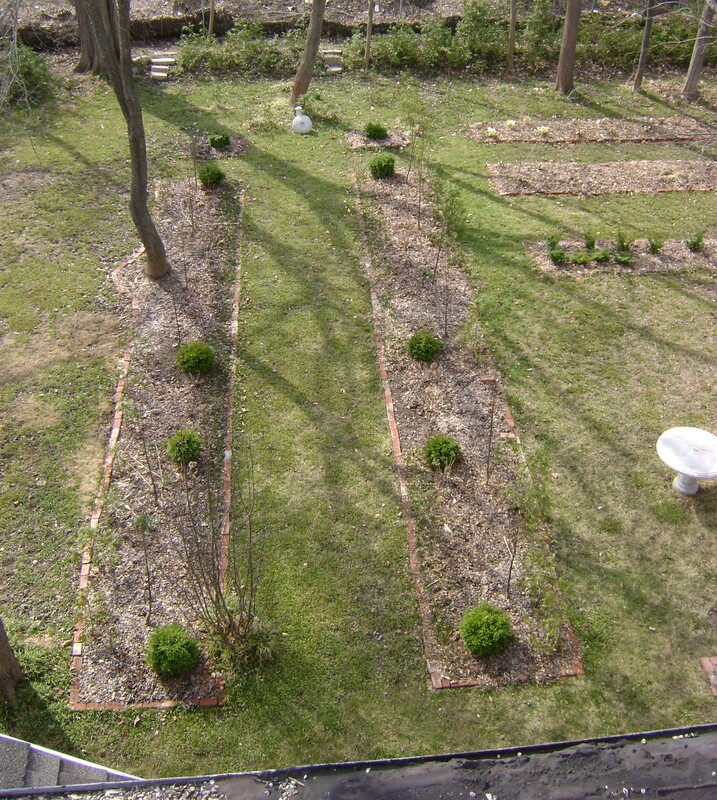 I know why I like it, I get such a great view of my garden, and I am hoping, in a few years, when the hedges start to thicken,you will not be able to see from one room into the other (except in strategic places). This will be the only way to see the whole garden at one time. It is nice to be able to look back over the years and (hopefully) see lots of changes. Last year, I took the photos in early April, so not a lot was in flower at that point. This year I had to wait until early May, I don’t think Ian would be happy about me climbing on the roof without him there to supervise. 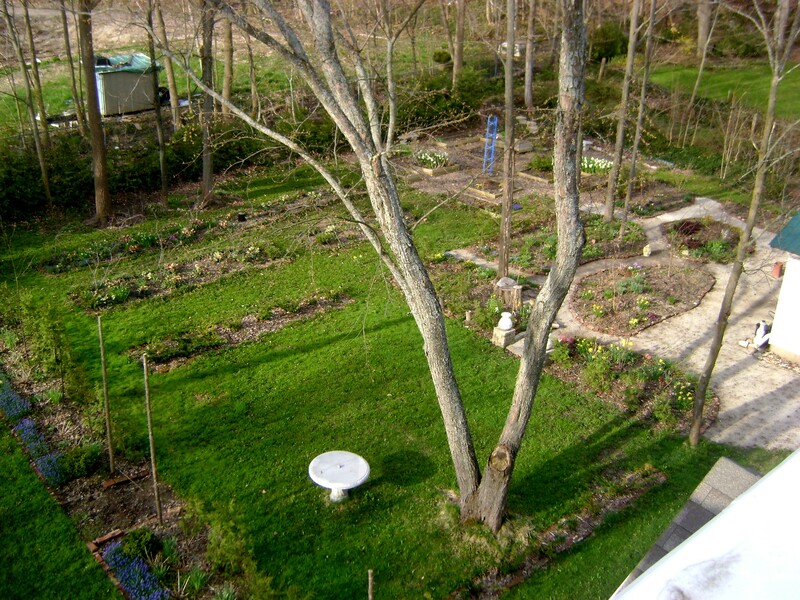 So you can see the garden is much further along. 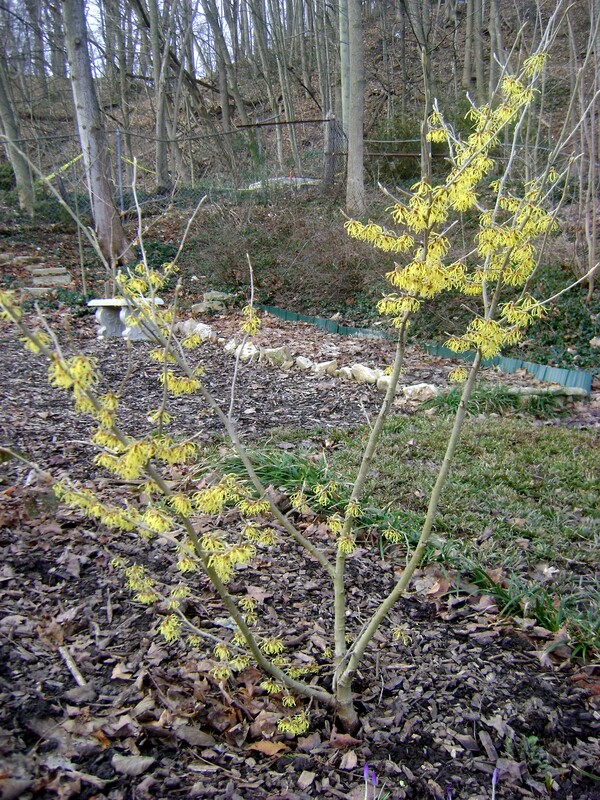 In the front, the ‘Magic Fire’ witch hazel is placed against the cedar backdrop. The scilla at the bottom of the photo surround the ‘Daybreak’ magnolia. 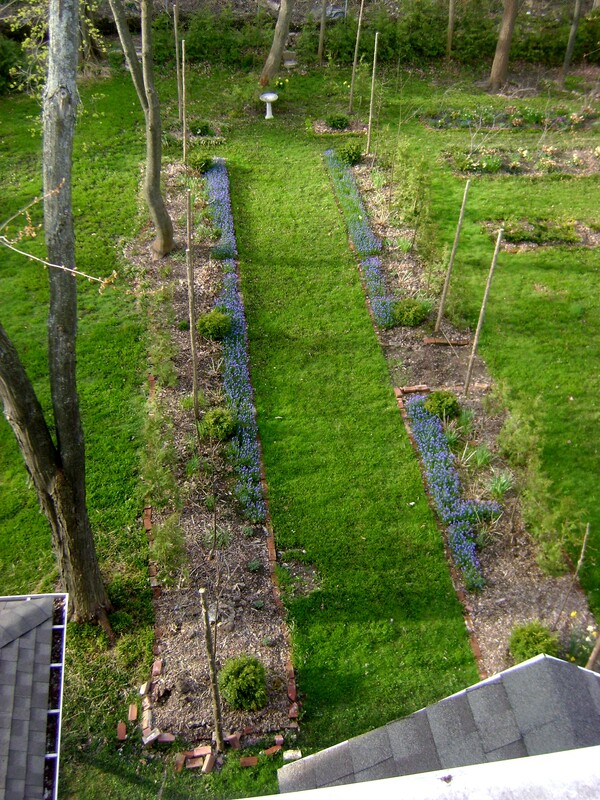 The muscari in the Lime Walk are thickening up. 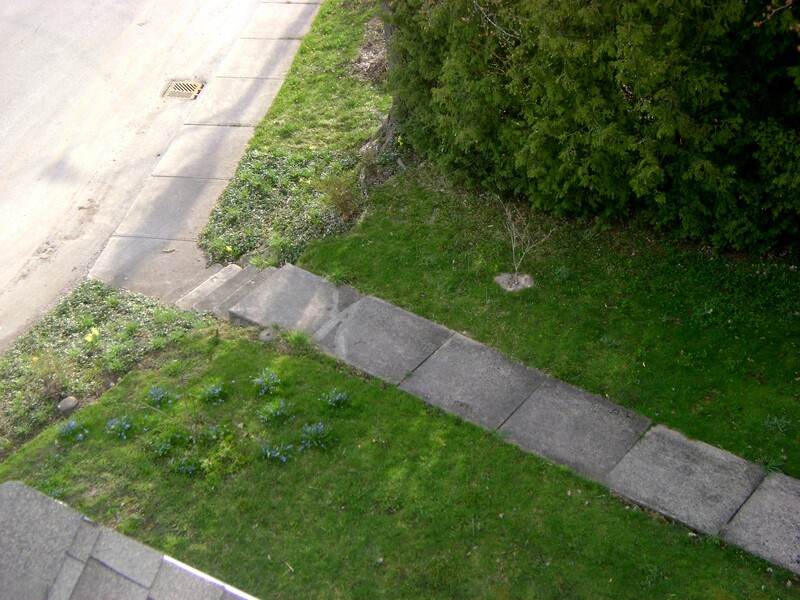 On the right, the path will lead into the Yew Garden, on the left, I need to move the plants to create a path to the croquet Lawn. 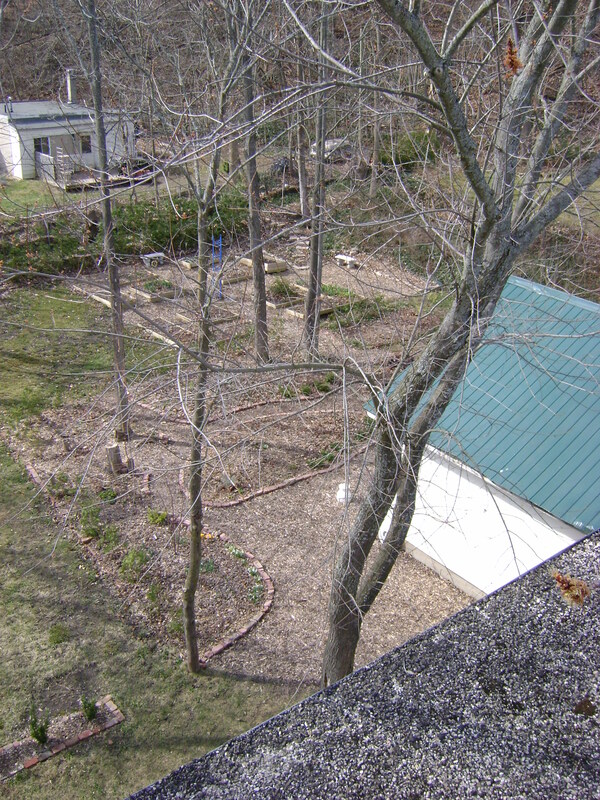 The Serviceberry Allee at the top of the photo, leads into the Kitchen Garden. 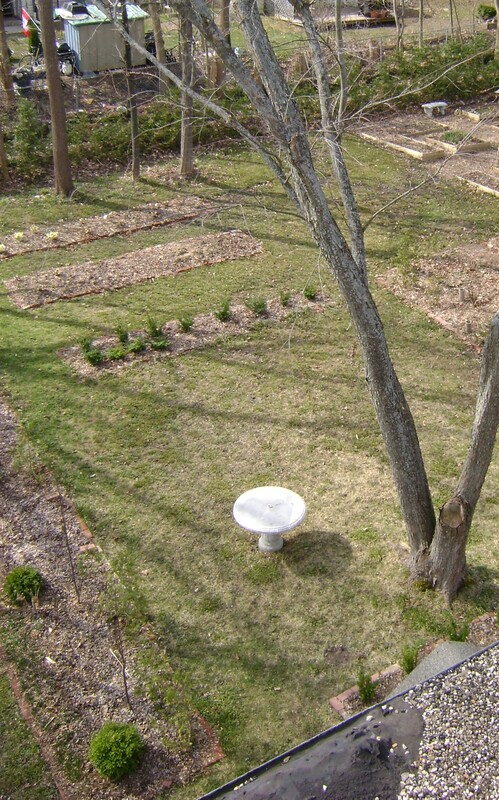 Here you can see the Flora Glade and Kitchen Garden in closer detail. Maybe one day I will learn how to post photos side by side, so you (and I)can see the difference from one year to the other. I am greedy, greedy for spring! It is my favourite time of the year, nothing (in my mind) compares to it. And so I am always looking for plants, trees, bulbs etc. that are early. Now early does not always mean the same thing to everyone. To all you lovely UK bloggers, early is January. I would love to have something flower in January, but there is no chance of that in Owen Sound. When I lived in Toronto or in Kingston, I would sometimes have snowdrops flowering in February, but at Kilbourne Grove the snow is deep. It often doesn’t melt until the end of March. 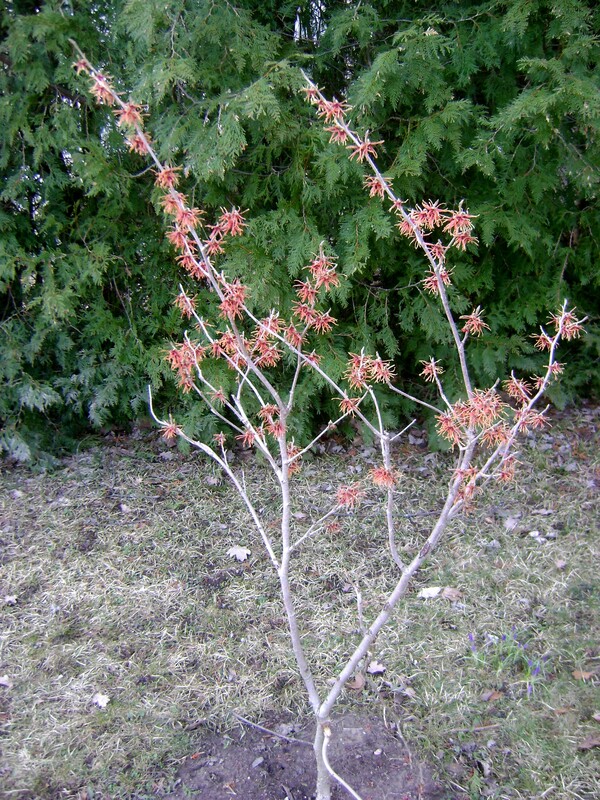 So the bulbs and perennials (hello Helleborus) stay buried until then, but the witch hazels don’t care about the snow. They are above snow level, and just give it a wave. 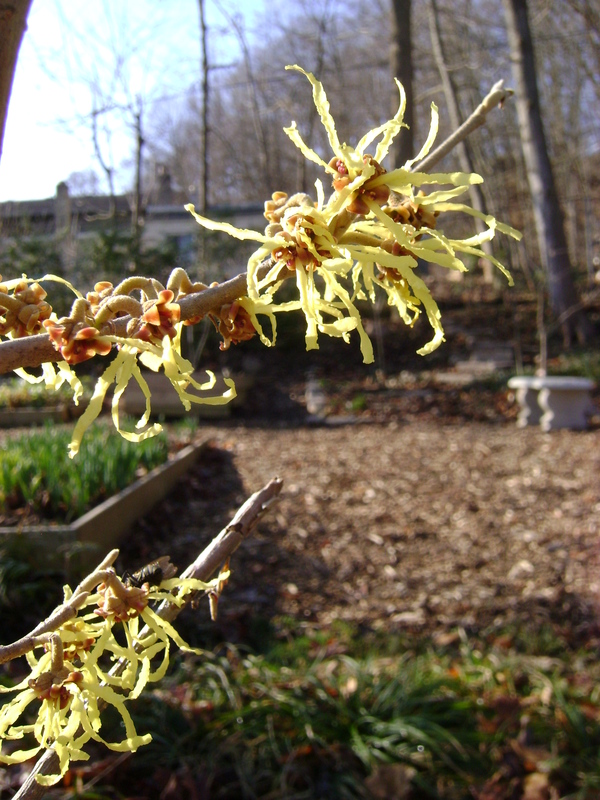 I started last year with Hamamelis ‘Arnold Promise’. Now he is two, and has put on a lot of growth. I think that his flowers are larger than last year. They look gorgeous, shining against the snow. I enjoyed him so much, that I decided to add another. Hamamelis ‘Magic Fire’ or ‘Feuerzauber’ is a lovely red/orange, brilliant against the cedar backdrop. I gave her (funny how she is female ) a underskirt of crocus tommasinianus, purple to set off her fiery locks. Now the question is, can I stop at two?